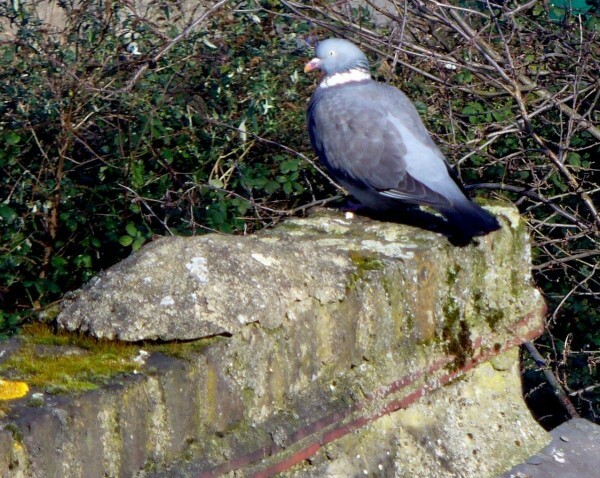 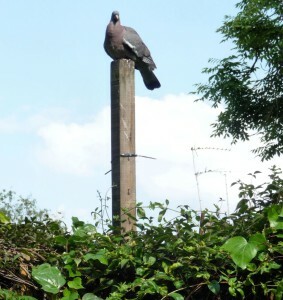 There has been a tribe of Woodpigeons living around the back gardens since at least 1995. 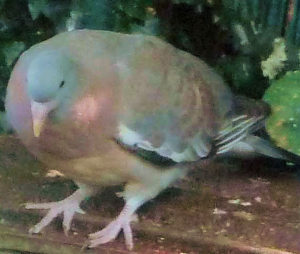 Large and stately, they are placid around other birds but can be quite fierce with each other, or where food is concerned. 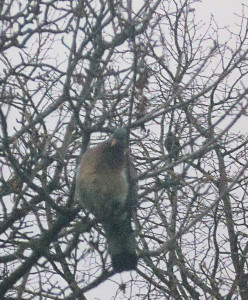 They were especially fond of pecking elderberries from our old Elder tree, venturing far out onto the tips of the branches to reach them. Woodpigeons battle at high table in the morning for grated cheese, sunflowers & soaked, crumbled seedy bread. 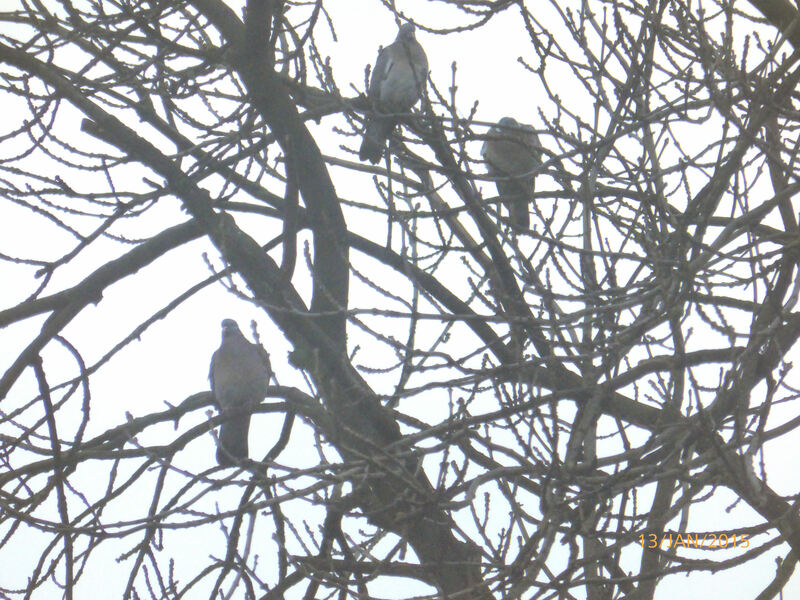 Two of them will stand in opposite corners of the table, each trying to intimidate their opponent. 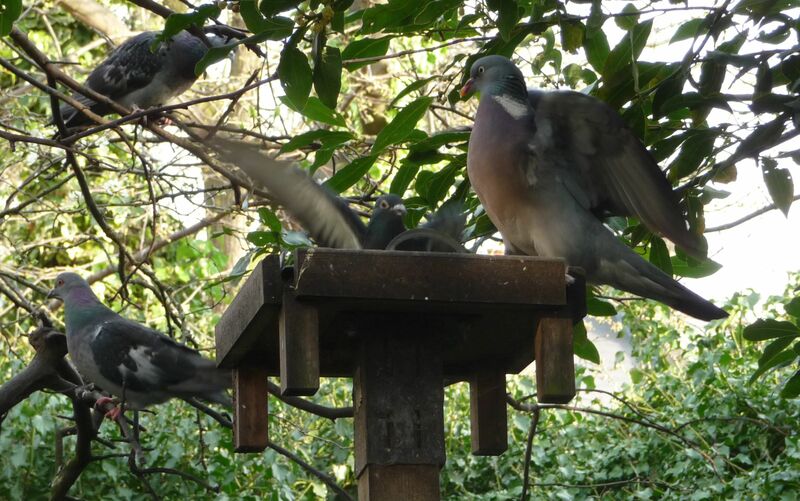 They draw themselves up to their full height with chests out, bring their beaks down to the centre of the table & peck the air in front of them rather than each other. 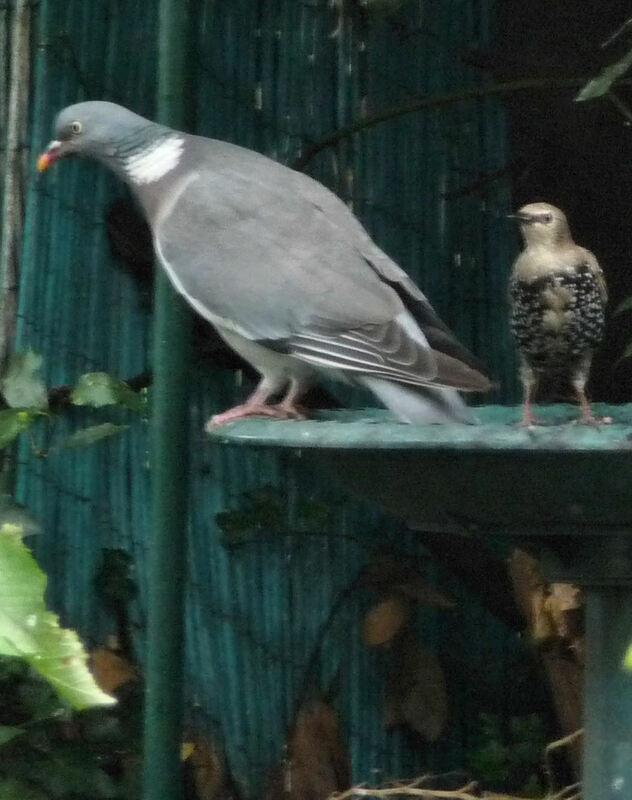 If there are only two Woodies, this is enough to keep both opponents in opposite corners of the ring while they gobble up bread & cheese & sunflower seeds. 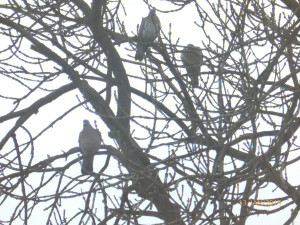 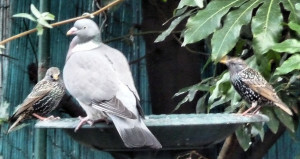 Another Woodpigeon move is a loud snap of the wing towards the opponent, like a karate chop that does not make contact. It is still intimidating. 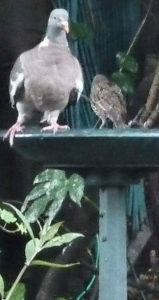 Often a Starling or Sparrow will land & peck up some food while the Woodies do their martial arts. 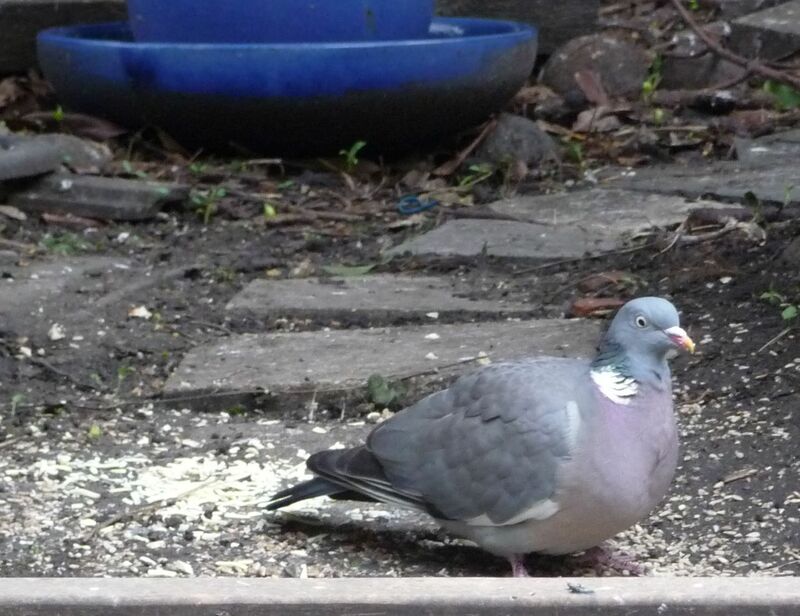 Some Street Pigeons now also appear for breakfast, but only the feistiest will take on the Woodies. 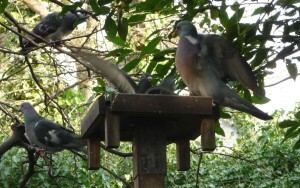 Late arrivals trying to land on the table will be pecked by the Woodpigeon in situ. 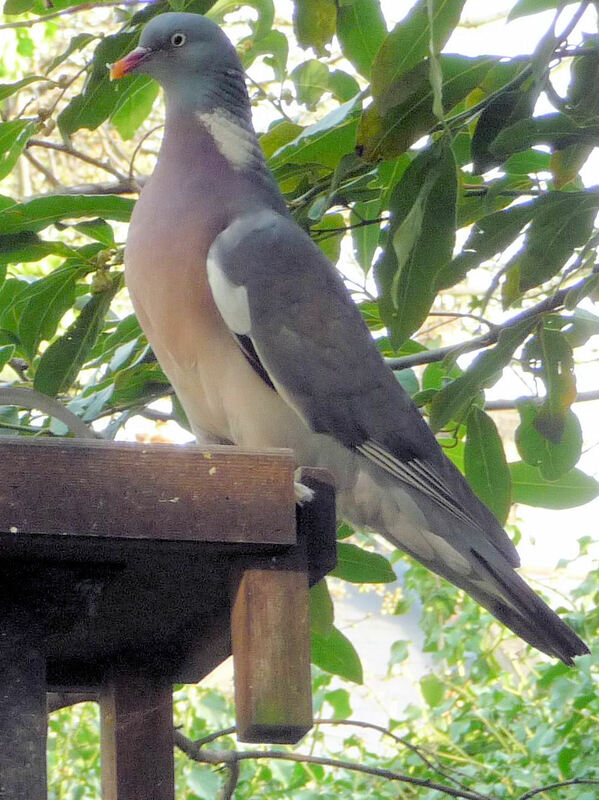 The Woodies spread their wings & snap them loudly, flapping & thumping into one another – each trying, like a Sumo wrestler, to unbalance its opponent & knock it out of the enclosure. Any bird unable to fight its corner is bumped off the high table. 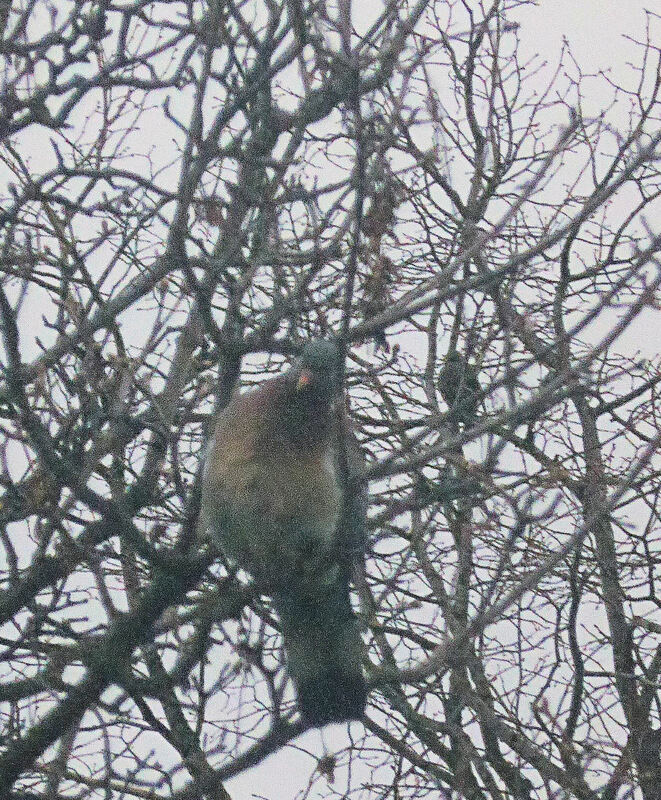 In a welter of flying food & belligerent cooing, the dislodged bird falls, flapping, from the table. 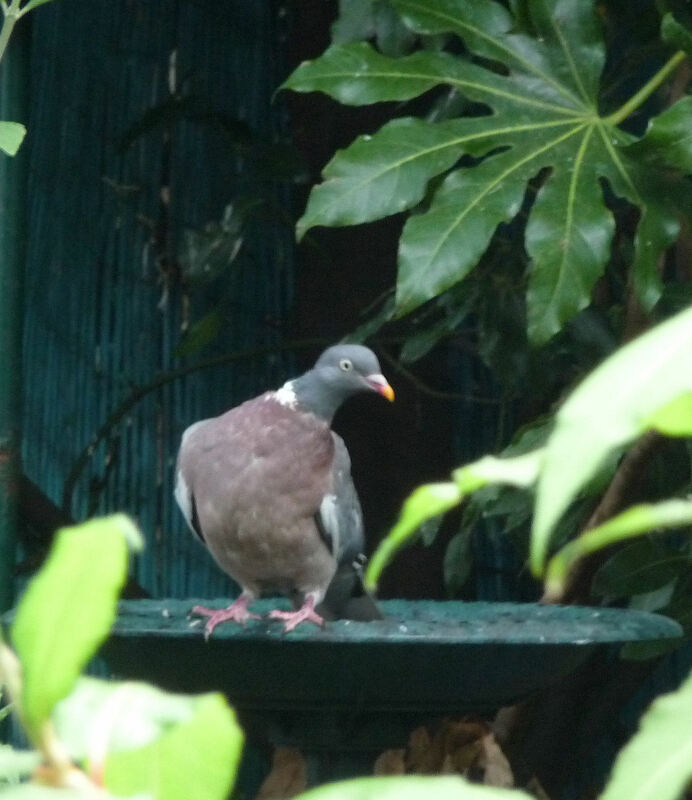 It lands on a branch, the birdbath, the ground… gathers up its dignity & tries again. 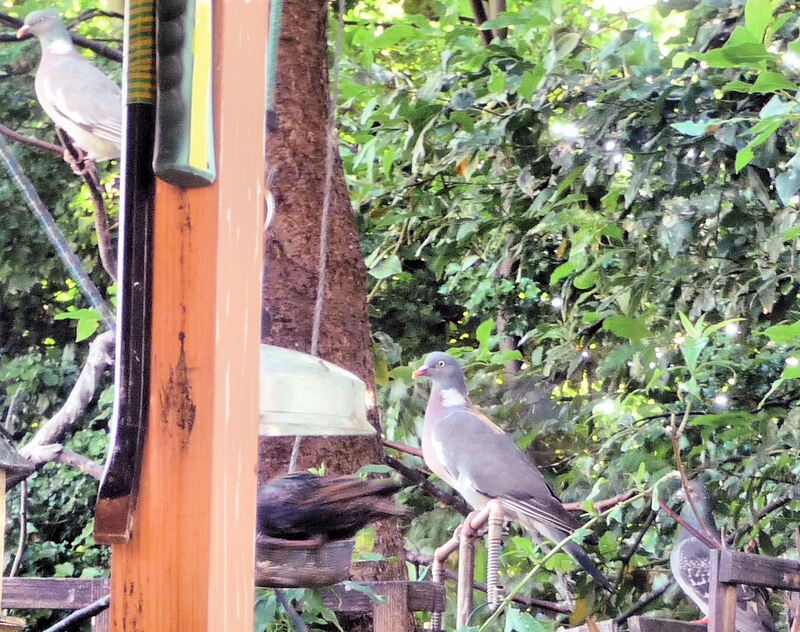 This goes on till all food on the high table has been eaten. 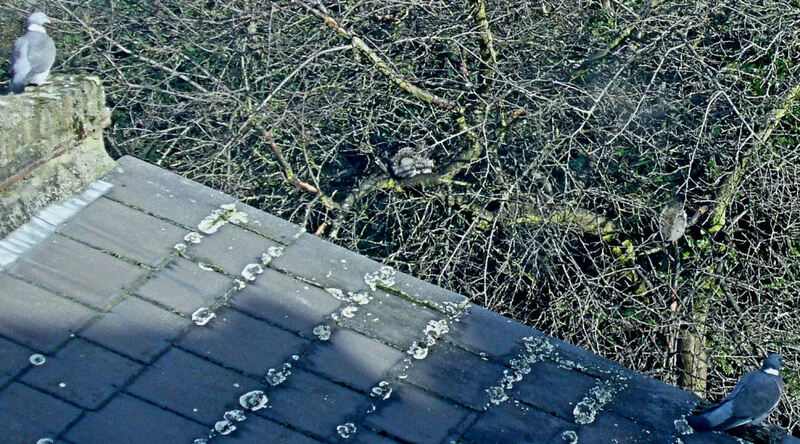 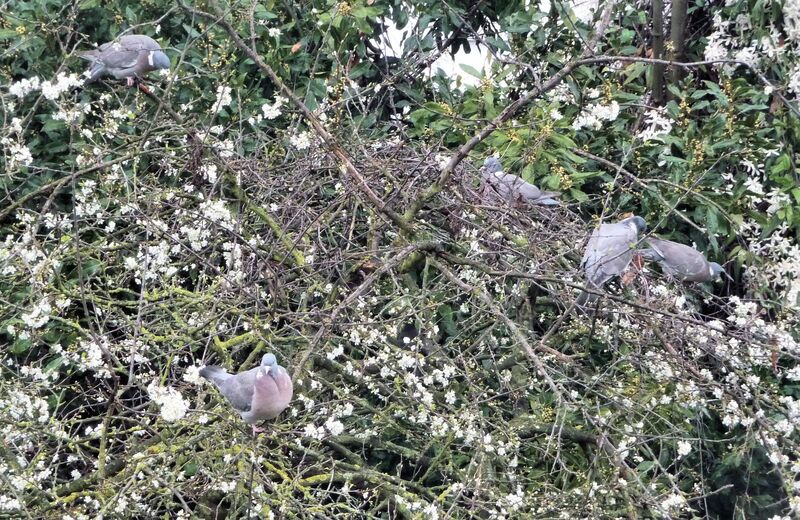 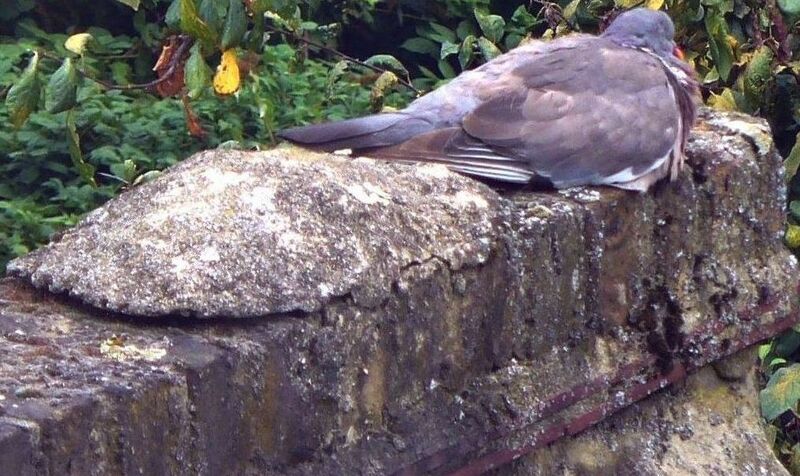 Then the Woodpigeons fly to one of the nearby trees or land on a roof, where they will sit quietly and sleep.